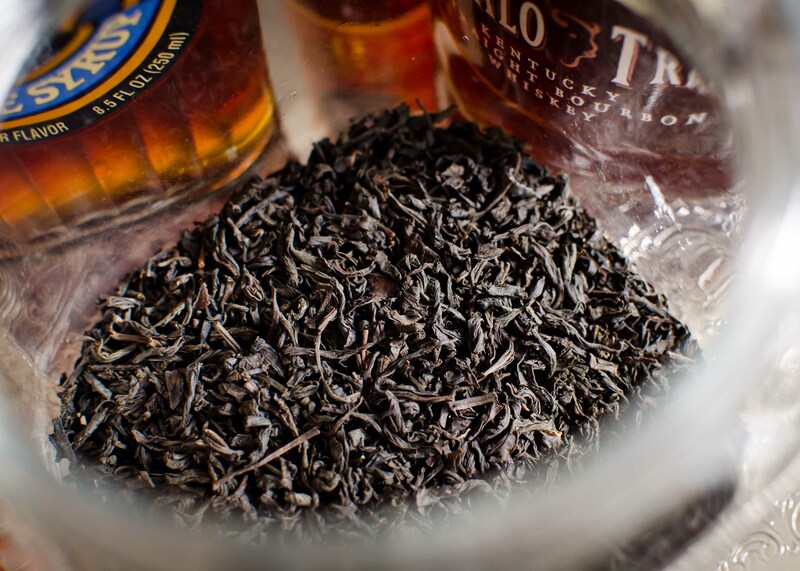 Say you infuse bourbon with tea…what happens then? A little while ago, I picked up a copy of Food & Wine: Cocktails 2012 (at a local Kroger, of all places): contained within it was a drink called “Tea At Three,” which infused gin with black tea and then combined it with sherry, lavender, and an assortment of berries (see p.148, if you have a copy). Reading the entry stirred up the familiar urge to experiment. Though I had combined tea and liquor before — in a Punch — and though infusing gin with tea was nothing new in the world of craft cocktails, such an infusion would be a personal first. With Fall just around the corner, I wasn’t in the mood for a gin drink, so out came the bourbon and the grand poo-bah of smokey teas, Lapsang Souchong. According to the book, the infusion would take a mere two hours (if that seems like too long a time to wait, it isn’t — not on this blog, anyway). I’d be lounging around, happily sipping an Autumnal potation while those other poor suckers would staring impatiently at their basement cupboards, waiting for their allpsice dram to finish. Wouldn’t you know it: the speedy experiment was a total success! Combine in a sterilized glass jar and allow to sit for two hours, shaking every now and then. If using loose leaves, filter out the tea leaves using a super-fine mesh strainer or coffee filter. Share and enjoy! The recipe is easily scaled up: if infusing an entire 750-mL bottle of bourbon, you’ll use about 6-1/2 teaspoons of tea. Seeking to create drink that highlighted the infusion but didn’t muddle its already-complex flavor, I decided that all that was needed was some sugar and spice. And what do you get when you combine brown booze with sugar and spice? 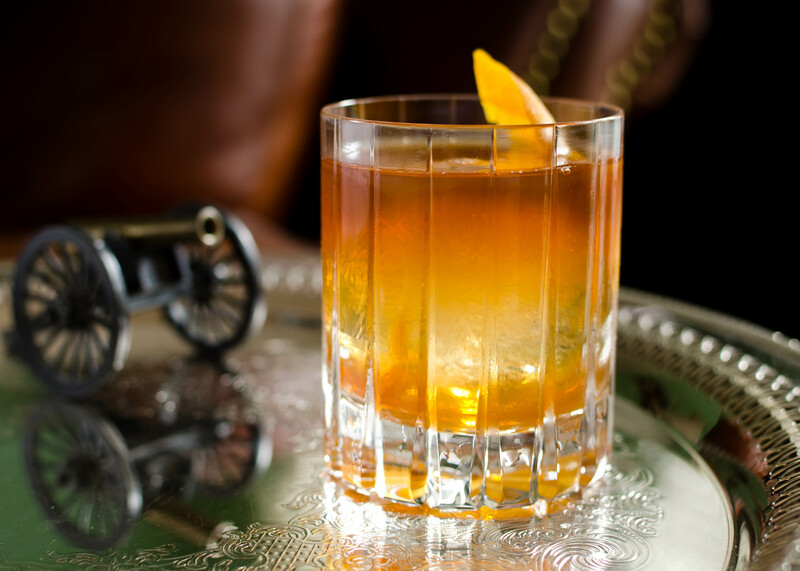 That’s right, an Old-Fashioned…but this wasn’t your ordinary Old-Fashioned. Combine bourbon, maple syrup, and bitters in a mixing glass and stir to combine. Add ice and stir briefly (5-8 seconds), then pour over an ice sphere in a double old-fashioned glass. Flame the twist over the drink and rub around the rim of the glass, then drop it in the drink. If you’d like a slightly stronger drink, do not stir with ice before pouring over the sphere, but let it sit and dilute for a couple of minutes. The nose on this drink was fantastic: wood smoke, caramel, orange rind, and medicinal spice, an Ocotber evening in liquid form. As for the ingredients, the maple syrup was a trick borrowed from the Applejack Old-Fashioned. While regular ol’ simple syrup might have worked just fine, I wanted something more rustic, with greater depth, and I didn’t have any demerara sugar on hand. Honey would’ve been a bit too intense — it doesn’t dissolve well and has a very particular flavor — so to compliment the infused bourbon’s bacon-like aroma and taste I went with maple syrup (think breakfast). To cut through the sweet and woody flavors, I added a dash of Angostura. To provide a bit of complexity and roundness — and to further accent the O.F.’s classic garnish, the orange twist — I added a dash of orange bitters. Simplicity at its finest. A word on Lapsang Souchong: the tea is smoked as it is dried over pinewood fires in eastern China and Taiwan. Some people love it, others hate it, but if you’re a smoked food fanatic like I am, it’s wonderful. Locating a good brand can be tricky — Twinings of London was once the Lauer family favorite, but the company has ceased selling tins of loose Lapsang and now only carries it in tea bags. Curse you, Twinings! This entry was posted on October 5, 2012 by IJ Lauer in Angostura, Bourbon, Drink Recipe, Infusions, Ingredient Recipe, Maple Syrup, Orange Bitters, Original Drinks and tagged bitters, bourbon, cocktail, cocktail photo, infusion, lapsang souchong, maple syrup, old-fashioned variation, recipe, tea.